The left has figured out several methods that successfully work to divide the left and the right. One of their cleverest ways is stirring up race wars, because it has the extra benefit of making the right look bad. The playbook goes like this: Spread the word nonstop that Democrats help minorities and Republicans are racist (never mind that it was mostly Democrats in Congress who opposed ending segregation — people don’t pay close attention to history). Once this false mantra has been established, label a broad range of normal behavior by conservatives as racist (it doesn’t matter if some of those conservatives are minorities themselves, like black and Hispanic police officers, contradictions don’t matter). Lump all that behavior in with that of the small number of real racists and refer to it as conservative or right wing (never mind that many racists are on the left, just gloss over that). Even better, create a new term that clearly refers to white supremacists, alt-right, and lump in mainstream conservatives. This tactic has allowed the left to write off one of the most popular conservative publications in the country, Breitbart, as racist. Since no one wants to be considered racist, it scares people away from being associated with conservatism. At the same time, the left aggressively promotes minorities over whites throughout all aspects of society in order to create resentment from poor, less educated whites. They use the most inflammatory language possible and push for the most radical left-wing activists in this area to give speeches and lead rallies. Instead of encouraging a harmonization of race relations, the left encourages voices who want radical policies implemented like race reparations and excluding whites from aspects of society. The left goes so far as to infiltrate white supremacist organizations and convince them they need to engage in “civil disobedience” to defend things the left has successfully been able to label as racist positions taken by conservatives (even if they’re really not). They take advantage of their poverty and lesser levels of education in order to convince them that these are the most crucial issues facing them today. The left secretly attends white supremacist meetings and posts anonymously on white supremacy websites in order to accomplish this. This is exactly how the rioting in Charlottesville went down last week. The left stirred up a handful of mainly lower educated people, some who are racist, to engage in threatening protests over the Confederate statue of Robert E. Lee being removed. They were able to accomplish this because the left has been secretly promoting a fanatical obsession with the South among lesser educated, white males in the South in recent years. 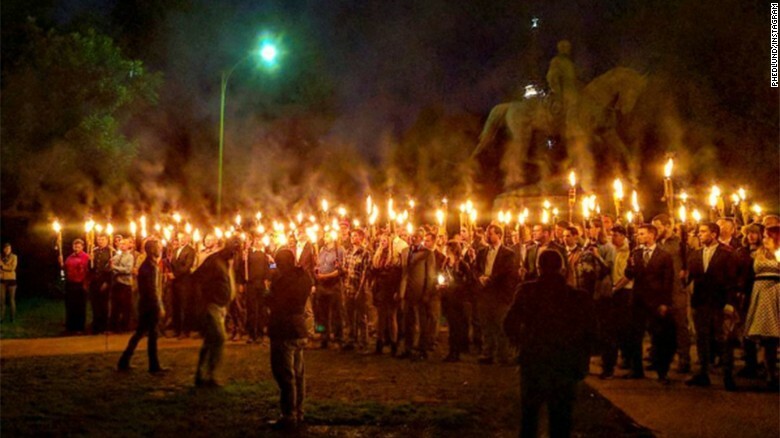 What used to be a passing interest in Southern history has been transformed into an almost nationalistic worship of its symbols that may have some direct or indirect association with slavery. The left also hyped up the association among radical black activists to further incense the situation. This had the successful result of broadly (and unfairly) tying white males to racism. Some suggest the overhyping may have contributed to the tragic death of one person at the protest, with several more seriously injured. A man who appears to be part of the protest drove his car into a group of AntiFa counter-protesters (far leftists who are also known for violence), killing a woman. When events like this happen, it gives the left even more support for their argument that people on the right are really bad racists. If it comes out later that the driver, James Alex Fields, Jr. was a Democrat, apolitical or just mentally ill, it won’t matter, the left has already convinced much of society that reprehensible racists are on the right. Perhaps tellingly, an article in The New York Times focusing on Fields has plenty of details about him but nothing about his political views. The left could have brought race relations to the most amicable level yet under President Obama. As the first black president, Obama could have used his bully pulpit to show that racism has greatly decreased. Instead, he made things worse with his remarks asserting racism where it likely hadn’t occurred, such as encounters with law enforcement. This helped bring about the creation of Black Lives Matter. Increasing levels of racism doesn’t make any sense, considering people are more aware of the wrongness of racism today than ever. The reason the left perpetuates racial divisions is because it helps them with votes and support. They have to make up a false mantra in order to keep people voting Democrat, otherwise people would desert the Democrats’ failing policies. As long as blacks think Republicans are racist, of course that voting bloc is going to vote Democrat. It also helps the wealthy elites. Left-wing billionaire George Soros and Media Matters founder David Brock have amassed a huge amount of power riling up activists on the left. They stand to lose a lot of money and power if the little people underneath them are not perpetually outraged. The truth is, there weren’t Trump signs at the protest. This wasn’t a peaceful Trump rally full of conservatives. These protesters were armed and wearing riot equipment. They expected to engage in violence. Don’t let the left get away with the misinformation that these were conservatives. Violence at protests is mostly committed by the left, which is paid to riot by Soros-funded organizations. In contrast, conservatives vehemently oppose violent protests. Stop using the left’s clever, misleading phrase alt-right to describe these violent protesters, and disavow the protester’s label “Unite the Right.” It wasn’t.